While in LA last week, I didn't get to do much shopping due to my luggage practically exceeding the 50 pound limit on the first leg of the trip- yes I am that much of an over packer. But my sister and I did get to quickly pop into Old Navy while having lunch at the 3rd Street Promenade in Santa Monica, and I must say Old Navy, is doin' it well. I easily could have scooped up multiple pairs of bright and printed jeans, pretty dresses, and t-shirts galore, but I managed to keep things to a minimum and went with this striped, sequin, neon tee-love love. I can see this being styled so many different ways for the warmer months to come! Amazing heels! You look gorgeous! Still obsessing over that tee! Old Navy really IS doing it well! This is one overall look I would copy again & again! 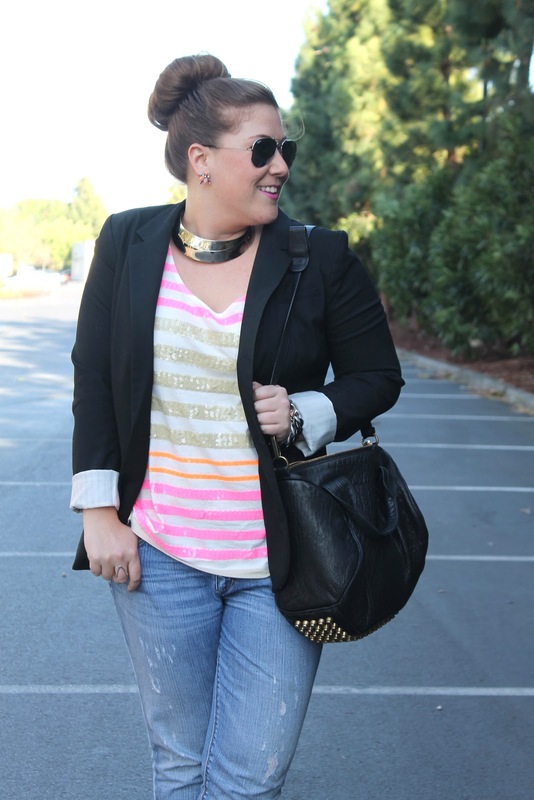 The blazer is truly a winner as it would look great at work and play!! Your style and beauty has grown so much since your first post! Love it Amanda! This post is fabulous. I'm such a sucker for a great tee and jeans combo! Werk it lady! Can't believe that tee is from Old Navy! Will definitely have to check it out. Yes, Old Navy impresses me with its cute basics! You are the master of wearing fun colors! Love your smile too! Gorgeous as always lady! And this tee is adorable...must go find it asap!